J.Crew’s Harwick messenger bag caught my eye recently. I’ve been a fan of J.Crew since coming across their site a couple of years ago. From shirts to formal wear to shoes and other accessories, this is my go-to store when looking for a wardrobe staple or simple yet fashionable wear. J.Crew’s accessories don’t really get as much publicity as their clothing and these are actually gems within a world of changing (and sometimes cringe-worthy) “fashion”. Back to the topic, I sometimes find myself caught in situations that straddle between the formal and casual. Carrying two different types of bags in a day for two different occasions/purposes of course doesn’t makes sense. 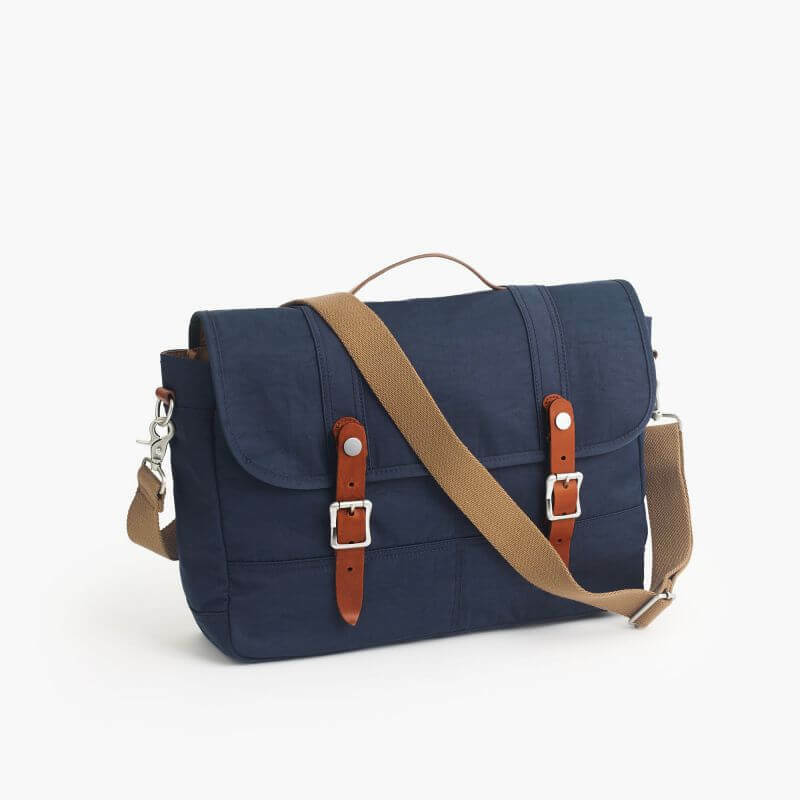 The J.Crew Harwick Messenger bag is one that is well-suited for such a day. The bag come in two colors – navy blue and olive green. Both colors are in a dark, muted tone, which again makes it less casual. You won’t be able to fit your files or folders though, as this bag is designed to be aesthetically slim. 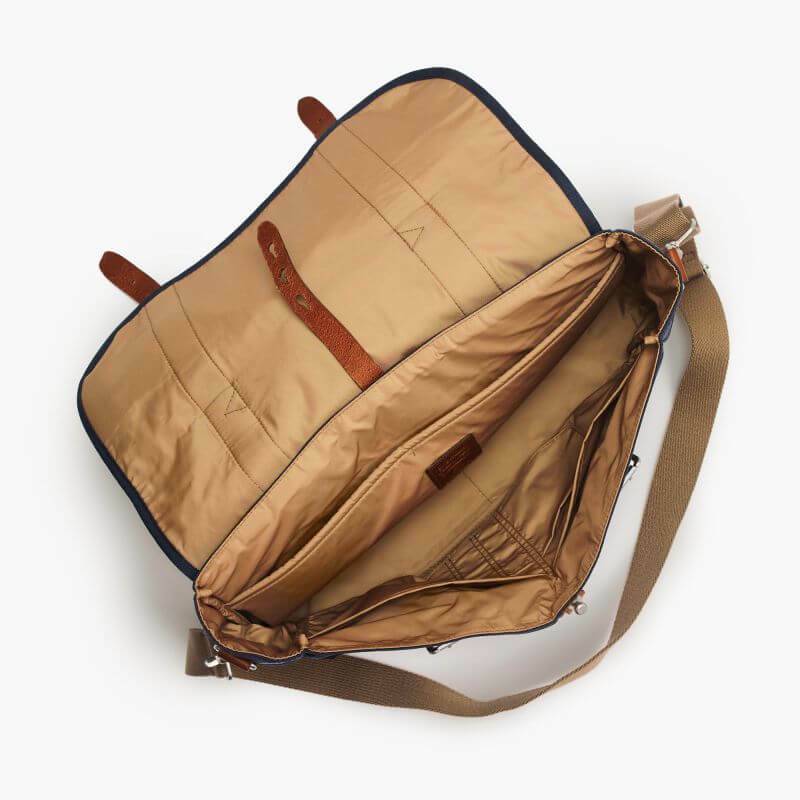 The caramel colored lining matches the navy exterior very well and the soft nylon lining won’t scratch or hold dirt particles like other materials, keeping the stuff you carry relatively scratch-free. If you had to pick a bag to bring to your lectures or for work in that smart casual laid-back startup, this bag is something that will fit in perfectly. The leather handle, zip pulls and trimmings also give it an edge over similar casual messenger bags (e.g. Timbuk2, Crumpler). The Harwick messenger bag measures 10 1/2″H x 15 1/4″W x 4 1/4″D, which means that you can fit most 13″ laptops, including the Apple Macbook Pro 13″. There is also room to fit a few books and a water bottle. It’s also made of water-repellent nylon fabric, you don’t have to be worried about getting it wet when you cross those puddles or brave a morning thunderstorm. This also means that you can wipe it down with some diluted soap to clean it easily. It’s also a lighter alternative to canvas or leather messenger bags. Overall, a great versatile and weather-proof messenger bag that will suit you in both formal and casual occasions.